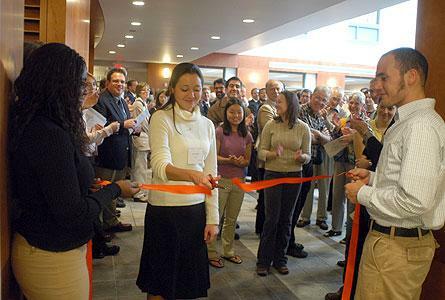 The science center, which was dedicated on Friday, Oct. 8, 2004, during Homecoming Weekend, houses the departments of biology, chemistry and biochemistry, the geological and environmental sciences, nursing and psychology. It was designed to complement the college’s on-going emphasis on collaborative student-faculty research as a teaching model, and organized to facilitate connections, roles in which it has excelled in the decade since it opened. Construction on the project began in March 2002. The facility includes an 85,900-square-foot building that was newly constructed and opened for the beginning of the 2003-04 school year, and the original 72,800-square-foot Peale wing, which had opened in 1973 and was renovated after the new building was completed. The science center was named in honor of 1967 Hope graduate Dr. A. Paul Schaap and his wife Carol of Grosse Point Park on May 5, 2006, in recognition of a leadership gift they made on behalf of the project.